Author’s Note: This is part eight of a series on the redevelopment of the old Southeastern University site in Southwest. These articles will serve to provide information for the greater community, and not to take a side on the development debate. This series, started in Sept. 2015, continues to focus on the site at 501 I St., SW, where Shakespeare Theatre Company (STC) and Erkiletian Development Group have proposed the development of a mixed-used building to be named “The Bard,” after William Shakespeare. 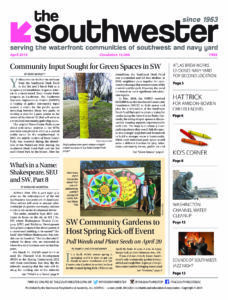 Past articles can be found on “The Southwester’s” website for those who are interested in where this story has been over the last four years. On March 11, ANC6D voted 5-1-1 to send the Planned Unit Development (PUD) to the Zoning Commission (ZC) with three conditions: that they flip the sidewalk, meaning that the trees will be along the building side of the sidewalk instead of the street side matching the west and east sides of 6th street; that a memorandum of understanding is reached with United Neighbors of Southwest (UNSW); and that one is reached with Amidon-Bowen Elementary School, which must be done within 30 days. The ZC hearing, to assess these terms, was held on March 28. The property at 501 I St., SW consists of approximately 36,476 square feet of land. It will also include a second building called an “annex” which will house the STC fellows and actors, as well as costume, rehearsal and administrative space for STC. In total, 87% of the project would be residential and 13% would be cultural. The main building will stand at four-stories, with a requested maximum height of 48 feet and include a habitable penthouse with 69 units for sale. Affordable housing within the project would consist of the minimum eight required: three 3-bedroom units, one 2-bedroom unit and one junior 1-bedroom unit. The 3-bedroom units are located near the overloading docks, which a member of the ZC remarked as “unfortunate” and these units are “put in places that you can’t sell a market rate unit.” The annex is requested to stand at 48 feet and 2 inches, standing right up to the property lines of other properties, including the playgrounds at Amidon-Bowen Elementary School. The Office of Planning recommended the passing of this PUD, and that it is comprehensive with the Small Area Plan. DDOT also had no concerns and recommended the passing of the PUD. The ANC also lent their support at the meeting. The United Neighbors of Southwest, who withdrew their advanced party application and their opposition to the project, testified neither in support of nor against the project. The memorandum of understanding was signed the night before the ZC hearing. Other parties that testified included the Amidon-Bowen PTA, which highlighted that they had several concerns, though testified neither in support nor against the party, including voicing concerns regarding safety from an increase in vehicular traffic and the impact of the buildings on the playground, particularly the proximity of the building to the property line. Arena Stage testified in favor of the project, particularly with what it will provide the neighborhood in the arts sphere. If approved, this project joins numerous other construction projects that would begin at roughly the same time. The next hearing that will include this project will be on April 29. “The Southwester” will continue to cover this story and others as the neighborhood continues to change.